Okay. At least that is established – we write. Does it matter what we write? Fiction: Flash fiction, short stories, novellas, novels, screenplays, theatrical work? 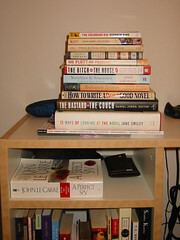 Non-fiction: Articles, web copy, ad copy, blogs, memoirs, books, biographies? To embrace a label is to be not only defined by the label, but limited to it. If you are a competent writer, schooled in structure, grammar, and punctuation, does it matter what kind of material to which you apply yourself? In my opinion – no. If you can write an article, you can write a novel. If you can write a screenplay, you can write copy. If you can write at all, you can write anything. You might be stronger in some areas than another, but don’t let a label set your definition of what you do. Editors and employers need a label in order to market your work; you may need them in order to market yourself. That’s fine, but don’t let a label or market definition interfere with the basic precept – you are a writer. Honing your skills in different formats can only enrich the process as a whole. Writing fiction can teach you a lot about pace, structure and creativity. Writing flash fiction can teach you the value of the well-placed word and conciseness. Writing articles can teach you discipline, more structure and Mad Research Skillz. Don’t be afraid to branch out into areas in which you haven’t ventured, because you’ve thought of yourself as only one kind of writer. You might not be successful in every endeavor you undertake, but often we learn more from our failures than we do our successes. Think outside the box and take a chance. It’s fun, it’s a learning experience, and you never know what you will uncover once you take the label off. So, strip off the label and get naked – and write! Once again, dead on. I do, however, have to admit something. If I were published and at the point where I was doing book signings….I don’t think I’d mind much! Jenn Astles last blog post..MORE TRENDHUNTER! Thanks, Big D! I’m glad you liked it. Hi Jenn — and believe me, I wouldn’t complain either. Heh. Thanks, lala. You know labels have always been a pet peeve of mine. Please vi$it me back ^^! Labels are good for concepts that fit wholly within the given box. Rare are they. As for writing, it’s tough. It’s hard to get a good tempo, a steady pace. Rightly said to survive as a writer one has to do a lot of ground works before the smile. No one sees the background labor and drudgery but before the actual golden crops comes the actual ploughing and watering works. Well said. This is a very freeing thought — the idea that if you can write, you can write … ANYTHING. Thanks, taer. We’ve discussed labels many times — helpful, sometimes, but oh-so limiting. Thank you, Sudam. It’s true, there’s a lot more to this profession than people realize. 🙂 Jennifer. I really hope it was an inspiration to you — I know I have a habit of sticking my OWN self in a rut, and the world is much wider. All raise the mighty pen! We’re writers, we write! To be a self sustaining writer is an adventure sometimes more epic than prize wining fantasy story. The pen is mighty as your mind is. You sure have that right! Writers and money. A never ending story. Keep writing.